Robert Moses's name is writ large on New York in freeways, parks, parkways, dams and miles of squalid landscapes of failed urban renewal. On a national scope, his methods and teachings also inspired the generation of highway planners that built the Interstate Highway System. From "The Power Broker, Robert Moses and the Fall of New York by Robert A. Caro. “The Power Broker, Robert Moses and the Fall of New York” by Robert Caro tells the story of Robert Moses, of his transformation from earnest idealist to hardened pragmatist, of his accumulation of power acquired entirely without democratic process and of the impact of that power on New York City and the rest of the country. In 1943 Robert Moses came to Portland. As the end of World War II came into view, the political and business leadership of Portland (one and the same really) were concerned about the impact of the wars end on Portland’s economy. 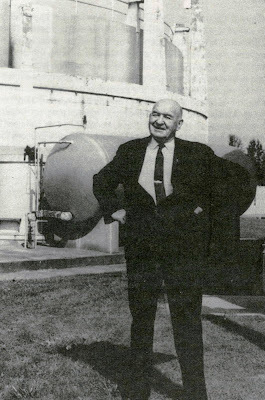 Torn between hopes of sustained economic growth and fears of a hard landing as wartime industrial activity shut down, they hired Robert Moses and his group of “Moses Men” as consultants to plan a postwar Portland. 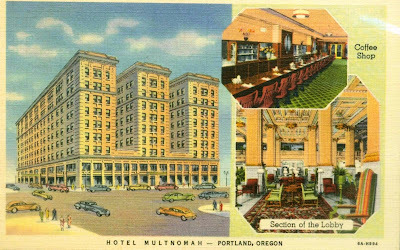 For two months, starting in September 1943, the “Moses Men” worked out of their headquarters in the Multnomah Hotel (now the Embassy Suites Downtown Portland). 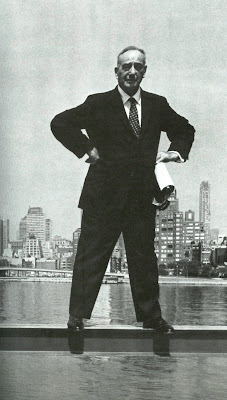 Portland City Commissioner William Bowes, an admirer of Robert Moses, strikes a Moses-esque pose. The report, titled “Portland Improvement” covered many aspects of civic enhancement. New parks, school and water system improvements, a civic center and new railroad station were proposed in the reports 85 pages, as well as an arterial freeway system that incoporated prior plans with a freeway loop surrounding downtown. A few years ago, I acquired a copy of Portland Improvement. 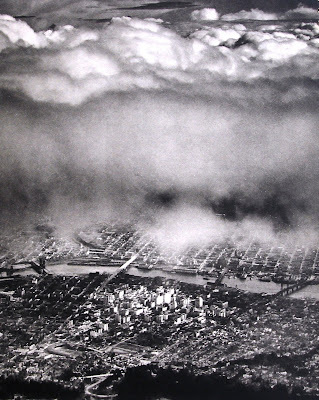 What follows is a view of the Portland of tomorrow, circa 1943. (Click on photos to expand). 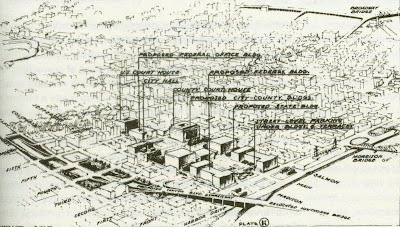 The plan emphasized freeway development. Transit was not addressed, it wasn’t even mentioned. One of the striking features of the map of proposed freeways is how familiar it looks, containing early versions of the I-5 routing through downtown ( further east) I-405 and I-205 (closer in). The plan called for a version of the Fremont Bridge with an express way that would intersect with Interstate Avenue and continue to a north - south expressway to be built over Vancouver and Williams Avenue. The expressway would have split the Overlook Addition in half, displacing hundreds of people, while avoiding a nearby little populated route up the Going Street gulch. The corner of North Shaver and North Overlook, where the Moses version of the Fremont Bridge’s east approaches would have been located. Perhaps the plan would have amended to avoid the neighborhood, but a reading of the Power Broker leaves no doubt the residential homes would have been of small importance to Robert Moses. From “The Power Broker, Robert Moses and the Fall of New York” by Robert A. Caro. The 1943 version of the Fremont Bridge (seen in this mock-up photograph from the report) was a suspension bridge, a style used by Moses for his Throgs Neck and Verrazano-Narrows bridges. Note that Harbor Drive (torn down to make Tom McCall Waterfront Park) is expanded north of the Steel Bridge. Harbor Drive was an important part of the highway plan. 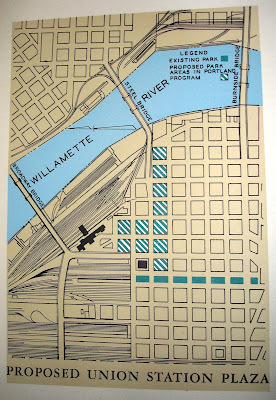 The proposed ramp system to the Steel Bridge is shown here. Union Station is nowhere to be seen. The eventual configuration of Harbor drive at the Steel Bridge was similar to the Moses plan. “Portland Improvement” called for a parkway on Harbor Drive and Front Avenue. In hindsight, it combines the past and present uses of the waterfront. 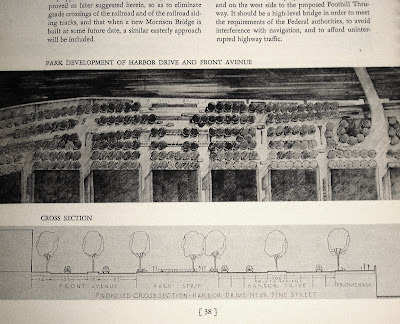 Like many of Robert Moses later landscapes, the “park strips” and “promenade” surrounded by multiple lanes of traffic were not particularly human friendly. Robert Moses found Union Station “unsatisfactory” and recommended it be replaced by a new station with an “attractive approach” of 10 blocks of parks, built over what was then called the North End (Old Town, Chinatown). Robert Moses would have approved of much in this picture, but even he would not have placed the east side freeway on the riverbank. The east bank of the Willamette in “Portland Improvement.” Note the placement of the freeway, away from the river between SE Seventh and Eighth. The plan called for a “Civic Center” of twenty square blocks. Funding for the idea was voted down in the election of 1946. The Civic Center, rejected in 1946. Note the “Canyon Blvd Expressway” on a “relocated Hawthorne Bridge” absent in the original plan. From “Portland, Politics Planning, and Growth in a Twentieth-Century City by Carl Abbot. For all of Robert Moses’ reputation as a builder of parks, “Portland Improvement” offered little in new parks (shown in light green). Nothing along the lines the future Forest Park appears in the plan, although a “parkway” along the ridge of the West Hills, essentially leading to nowhere (see first map in series) was proposed. Much of “Portland Improvement” ran afoul for funding in a series of postwar elections. Still, the plan existed as a template for much of Portland’s future development into the 1960s, especially the highway portion which was built by the state and federal governments. Even much of the Civic Center was eventually built, one building at a time. Robert Moses mark on Portland is also found with the infamous South Auditorium urban renewal project which slicked off 83.5 acres of downtown, essentially the old South Portland, for high rise apartments and the inner freeway ring. The South Auditorium project utilized urban renewal methods, theories and justifications developed and refined by Robert Moses to a much larger scale in New York City in the 1950s. 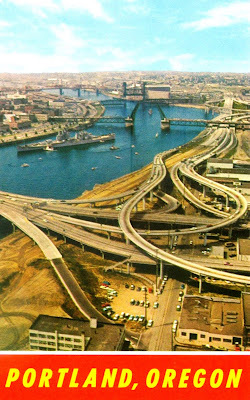 The Portland of tomorrow, circa 1962. The South Auditorium project is prominent as is the future #405, which jogs west to a version of Fremont Bridge that connects with Going in North Portland, thus sparing the Overlook Addition (the eventual Fremont Bridge would be much higher and intersect with I-5 to the south. 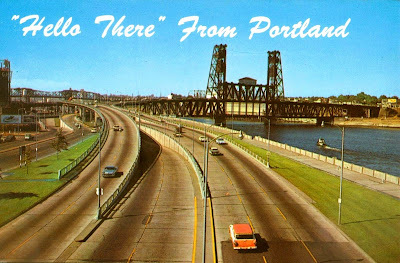 Note the smaller, straighter version of the Marquam Bridge, from which branches out the unbuilt Mount Hood Freeway aimed at South East Portland. The consequences of Robert Moses’s influence is still felt in Portland. His belief in freeways and disdain for transit influenced a generation of Portland leadership. Commissioner William Bowes decision to allow the removal of the Portland Traction interurban lines downtown loop to ease the construction of the new Morrison Bridge approach ramps in 1956 (and the removal of the tracks on the Hawthorne Bridge) was very much in line with Moses’s thinking. Thus a rail rapid transit system, discussed as early 1966, would have to start from scratch, decades and millions of dollars later. The old South Portland, lost in the South Auditorium urban renewal project, another Moses influenced idea, can never be recovered. Portland's and the nations reliance on freeways will be around for long time to come. “To build his highways, Moses through out of their homes 250,000 persons- more people that lived in Albany or Chattanooga, or in Spokane, Tacoma, Duluth, Akron, Baton Rouge, Mobile Nashville or Sacramento. He tore out the hearts of a score of neighborhoods, communities the size of small cities themselves, communities that had been lively, friendly places to live, the vital part of the city that made New York a home to its people. From "The Power Broker, Robert Moses and the Fall of New York" by Robert A. Caro. “Even if the state can find the extra billion dollars a year it says it needs just to maintain current roads and keep up with growth, drivers who used to ride the bus or take surface streets would quickly consume new freeway space." The Oregonian, February 11, 2007 “Car-chocked highways certain to get worse” by James Mayer. It's Robert Moses’s world, we just live in it. That is a fantastic book find and I had no idea Robert Moses had consulted for Portland. Any idea where I can purchase a copy myself? I'll have to go to the library and see if I can find a copy to read. Thanks for this post--so fascinating to know that Moses had a hand (or almost did) in Portland's landscape. The Power Broker is an amazing book, a light into how decisions are made. It will make you cynical, but also raise your level of understanding. If you like it, be sure to also read Fire at Eden's Gate about Tom McCall. Once again, an excellent post. I had read about the Improvement (I believe the city has a couple of the things on their site), but much of the stuff is new to me. 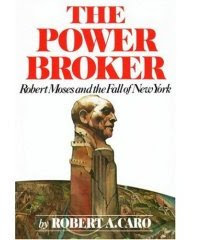 Just as an FYI from a planner in New York (and native Oregonian), the Power Broker is not an accurate or even honest account of the work of Robert Moses. The book has been a powerful force in urban dscussions over the past several decades, but it is not a reliable piece of history. I was downtown yesterday on a photo walkabout and shot some photos of the Dekum Bldg. I want to post some on Flickr and wanted to add some historical data. My google search brought me here. Very informative and well written. I was born in Portland in 1949 (the St. Vincents Hospital was just off Burnside, close to NW 23rd) and am ashamed to admit I had never heard of Robert Moses. It explains a lot. I remember downtown Portland from the 50's and miss some of the old buildings. There used to be a public farmers market downtown and I think that they even had a butcher shop that sold horse meat. Not very PC and I don't think my mom ever fed it to use. Anyway, I'm going to look at some more of your posts. Good work. Wow. Wonderful find. As a former Portlandite (both in NoPo and right off Hawthorne, on 16th), I'm both frightened and intrigued by what Moses could've done to the city. I'm wrestling with my opinion of him at the moment, as a Manhattanite. He wanted to destroy parts of two major neighborhoods - both mid and lower manhattan, upsetting any number of others like Chinatown, Hell's Kitchen, etc. - for the creation of more expressways. But he also did some great things for the city. Anyway, thanks again for the post. I just wrote a post about Moses, as well, if you'd like a quick read. Where is that awesome statue? I have never seen it! if you do a search on youtube, there are two interviews I've found of him. One great piece is a three part promotional by GM called Futurama 1954. It shows the auto-hysteria of that period. Robert Moses is receiving a very significant award in part two for the design of the "urban" part of the interstate system. The other is an interview from the Longines/Wittnauer Chronoscope TV program. His personality really comes out in the at one.